Source: Bougie E, Kelly-Scott K and Arriagada P. 2013. The Education and Employment Experiences of First Nations People Living Off Reserve, Inuit, and Métis: Selected Findings from the 2012 Aboriginal Peoples Survey. Statistics Canada. Catalogue no. 89‐653‐X. 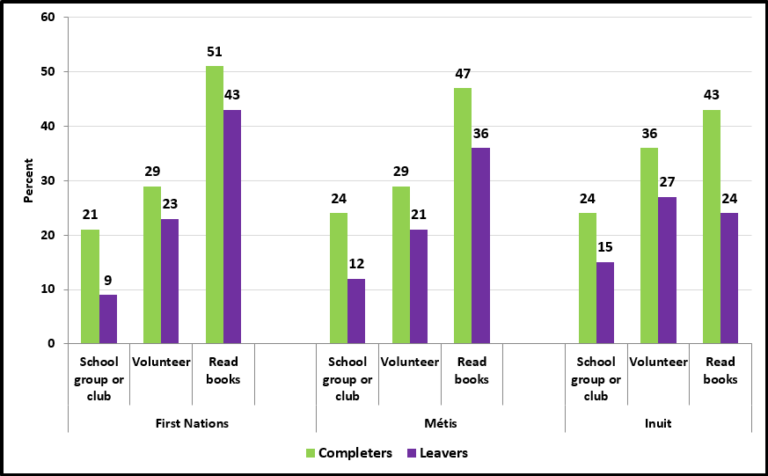 In 2012, Indigenous youth aged 18 to 44 who reported participating in extracurricular activities at least once a week, volunteering or reading books four or more times a day during their last year of high school were more likely to complete school than were those who did not. This was the case for First Nations, Métis, and Inuit youth. Participation in extracurricular activities and other activities such as volunteering and reading are key factors that facilitate school success. These activities provide not only learning opportunities, they also give youth a sense of engagement with and belonging to their school community, and contribute to a sense of self-worth, which also contribute to academic success.